Bottom all primed, ready for bottom paint. In 22 years no significant blistering on this solid hull. 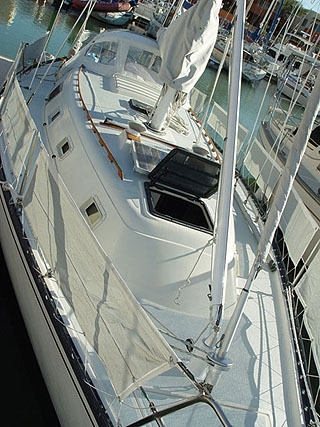 This classic well maintained 1980 Hunter Cherubini Cutter is cruise ready in the Sea of Cortez. Rugged construction and quick under sail, the perfect Sea of Cortez Cruiser or weekend adventurer. Our refit is nearly completed with more than $8,000 worth of upgrades including a solid rig, new interior, new dodgers, new lifelines recently hauled, painted and services and more! Designed by John Cherubini in 1977 the boat was built as a medium weight cruiser. I found discovered a great deal more to appreciate about the boat when doing research to sell her. The Cherubini design is as appreciated a boat design as a Corvair Classic in cars. Definitely different from future stylings of Hunters that evolved during the mid 80’s, the boat is far from being a ‘Clorox bottle with a mast’ as some boats from the mid 1980’s became know. Google 37' Cherubini Cutter and see for yourself! She is a middle weight cruising sailboat by definition at 18,500lbs. Shower stall separate from toilet - no straddling the bowl to shower! Hand laid, not chopper gunned, the hull is strong and durable with nearly 1” of fiberglass at and below the waterline. 7000lbs of lead in the keel provides excellent stability and large kedged rudder and staysail allow you to point several degrees closer to the wind than standard Sloop rigs. Roller fullers on both forward sails and almost all rig lines are run back to the cockpit for safety and ease of use. ‘Noserlies’ are a common wind direction in the Sea of Cortez. 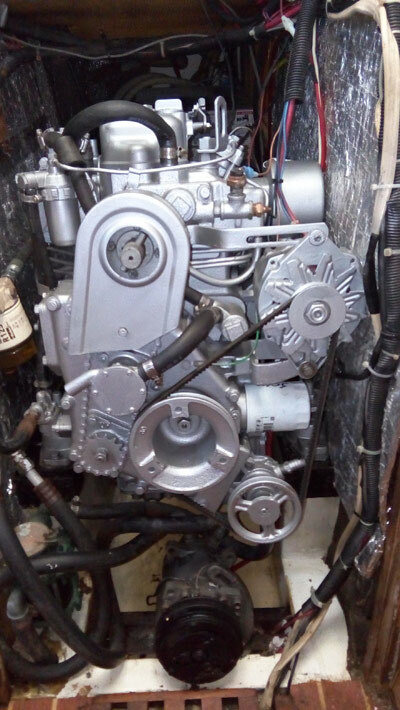 Many sailors are often heard to say “You know you have headed the right direction in the Sea of the wind is directly on the bow.” This is where an efficient propulsion source can be handy. With a 32hp Yanmar that has started every time I have turned the key for the last 15 years, I have been able to power my way through those days that offered less than favorable wind conditions. Burning about one gallon an hour even at full throttle the 17” prop gets me where I’m headed in doldrums or gales. An excellent cruising RPM of 23000 will get you 6.2kts and about 3/4 of a gallon per hour or less. The vessel comfortably sleeps 4 (real) adults and one child size berth. The aft cabin is separated by a pocket door and currently used for dive gear storage. With your installation of a new mattress, the aft cabin would sleep 1 to 2 more. Your chef will enjoy the spacious remodeled galley, equipped with icebox, refrigerator and rebuilt classic two burner propane stove protected with a Xinex propane sniffer and safety system. Why are we selling after 22 years of ownership? It will be a hard parting, with all those adventures and hardly a lick of trouble in all those years. I'm very tall and despite the vessels uniquely spacious 6'4" headroom, I am yet still taller than that and we're moving up to a larger sailboat. A value at $34,500USD – No California Sales Tax with Off-shore Delivery.